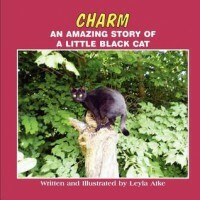 Leyla Atke has written a beautiful, charming tribute to a tiny black cat that was miraculously introduced into the author’s life. Each providing love and warmth, a bond is formed between writer and a cat she names Charm, that is short lived and unfairly ended. Missing and mourning her beloved Charm, a tiny black miracle appears in a most familiar place. Coincidence? A blessed second chance to make things right? However the reader perceives the message, it’s a story that can be loved by all ages and one that animal lovers can identify with.